The upcoming new new Ford Fiesta leaked early before its later-this-afternoon official reveal and we can already tell you that the new new subcompact hatchback is bigger, newer, and more closely resembles a cute but sad guppy fish that only wants your love. 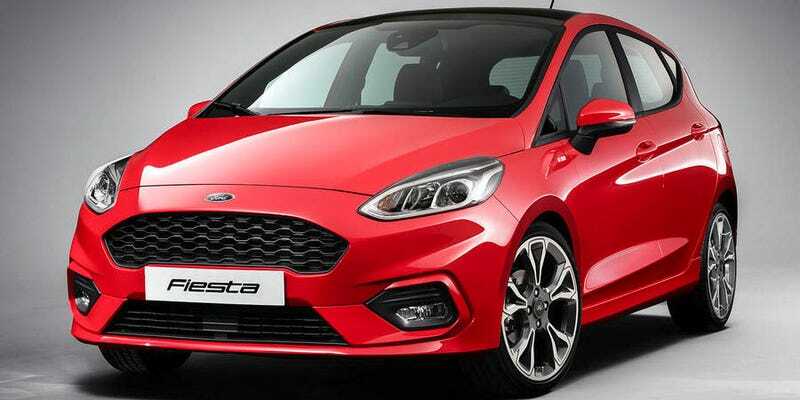 This new Ford Fiesta is not a re-skin of the current Ford Fiesta, which is a re-skin of the Fiesta that debuted back in the end of 2007. It is a new and larger car. Other than that, all we have to go on is this picture dropped early by Autocar. Anyone who has driven a Fiesta in anger will tell you that it’s a remarkably fun car, perfectly sideways on dirt regardless of engine choice, or especially peppy on pavement with a bigger turbo ST motor. The only question left in my mind is if the upcoming car will live up to the standard of the current legend-in-its-own-time Fiesta ST. Can a FiST be fun if it’s bigger and blobbier? We’ll see. For now, look at this sad lil’ face.